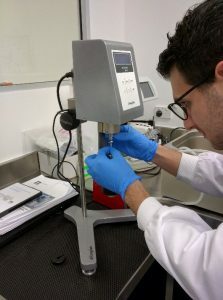 A research officer assembling the viscometer at Regeneus. In 2008, mesenchymal stem cells were not gracing the front page of prestigious academic journals as they do today. Yet the founders of Regeneus knew differently. 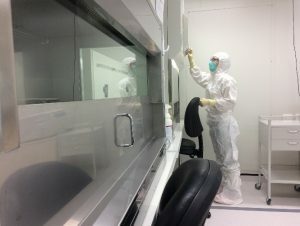 A company that began when three scientists who had completed their PhDs at the same time in Professor Keith Williams’ bioentrepreneurial lab at Macquarie University in the mid 90s, were quick to intuit the potential therapeutic benefits of mesenchymal cells, Regeneus has grown into a leader in the Australian regenerative medicine industry. An ASX listed clinical-stage regenerative medicine company, Regeneus works to improve people and animals’ lives through the application of proprietary stem cell and immuno-oncology technologies. This internationally-recognised and innovative work is happening in our backyard: Australia. Better still, Regeneus is supporting the industry at large by contributing their expertise as a member of CCRM Australia’s industry consortium. Osteoarthritis is the fourth-greatest cause of disability in Australia, making it the first therapeutic focus for Regeneus. The company’s “off-the-shelf” principal cell therapy product, Progenza, aims to control and alleviate the pain of those suffering from osteoarthritis and modify the progression of the disease. Currently delivering positive trial results for knee osteoarthritis, Progenza is becoming a promising treatment option for osteoarthritis and other musculoskeletal disorders, with the potential to be used for other inflammatory conditions as well. Progenza, a treatment composed of culture expanded stem cells from a healthy adult donor’s adipose tissue that are not genetically altered, works to reduce inflammation and to promote the repair of damaged tissue. One of Regeneus’ researchers in the room where Progenza is made. For John and Regeneus, 2018 will have a strong focus on collaboration and clinical trial progression. Having delivered positive results for the Phase I safety trial in May 2017, Progenza met the primary endpoint of safety and tolerability. Demonstrating that patients treated with Progenza had statistically significant pain reduction and reduced cartilage degradation, in comparison to those treated with a placebo, there is a definite future ahead. At CCRM Australia, we will be watching Regeneus closely and looking forward to seeing where 2018 takes them. For more information on Regeneus, click here. You can follow Regeneus on Twitter via @Regeneus. You can follow Regeneus on LinkedIn by clicking here.